I think this will be my last post on the retreat and then I am ready to move on to some other things going on around here! Pictured about is a crazy quilt done by Claudina Hruby..I think it is just gorgeous. This is a picture of the 1st place winner of the pansy contest I had. 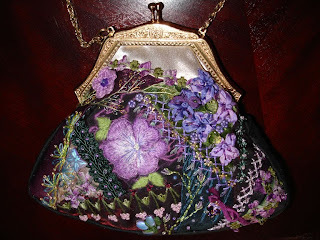 It is a beautiful purse done by Heather Brighton of Canada. I just love everything about this purse. Here is a picture of the 3rd place winner of the pansy contest. It was a cover for a photo book. I think it was just amazing and was done by Sherry Johnson. I don't have a picture of the second prize winner, but it was a beautiful mussie tussie done by Chris Norris. Here is a picture of myself with all of the three teachers! This picture was taken the last day after it was all over, hence I may look just a little bit tired. All in all it was a wonderful time and I am already looking forward to next year with only 11 months to go! I am so sorry I didn't make it to this years retreat....especially after seeing your pictures! I hope you run another one next year. I don't want to miss it!